Advertising network VideoEgg will acquire blogging and advertising network Six Apart, and the combined entity will be renamed Say Media. The companies will officially announce the transaction tomorrow. VideoEgg CEO Matt Sanchez will run the combined entity as CEO. Six Apart CEO Chris Alden will step down. The SAY Media site will launch tomorrow, but we’ve included a screenshot of the home page. 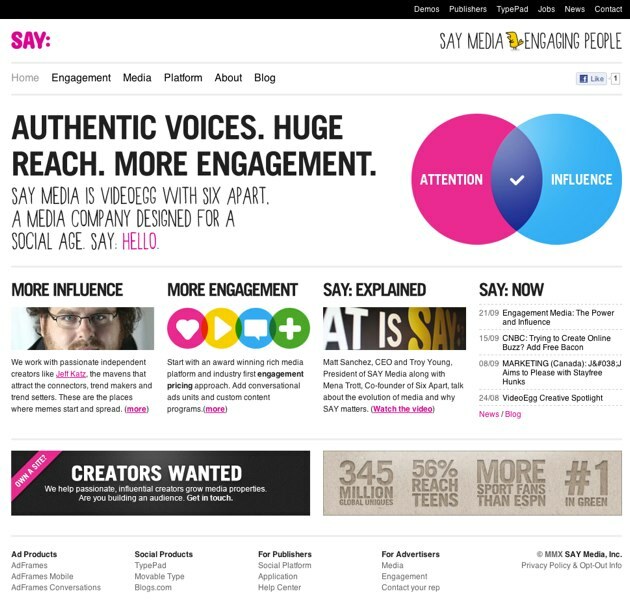 Update: the SAY Media site is now live, and the news formally announced. The combined company will reach 345 million global unique visitors, says the company. These are direct visitors to hosted sites as well as third party sites running ads from the companies. The combined company will have over 300 employees, and “the vast majority of Six Apart employees will move over,” says Sanchez. There have been rumors that some of Six Apart’s flagship products will be shut down. The company is shuttering Vox this month, for example. But Alden says that Say Media will continue to support and grow the Typepad and Moveable Type platforms.